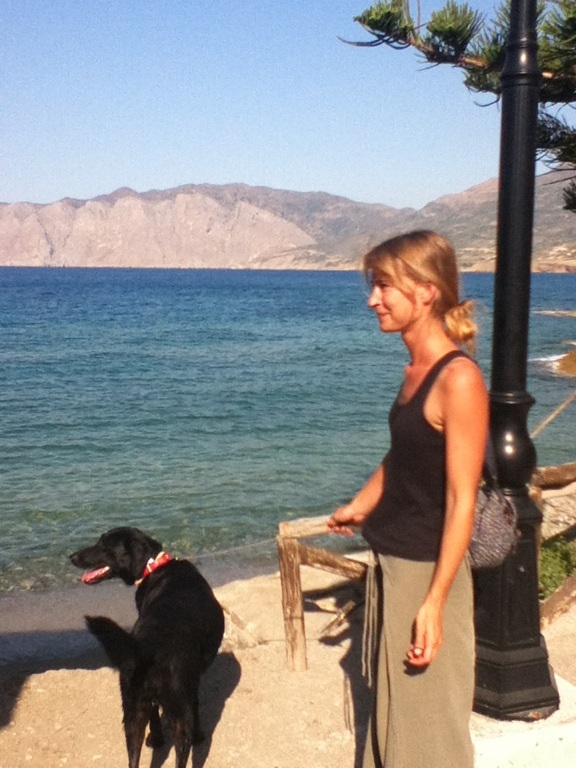 Being a non-beachy seaside village, Mochlos is quite a dog-friendly place. Not to mention that it is outstandingly beautiful and I can't write about places to visit in Crete without raving about Mochlos. 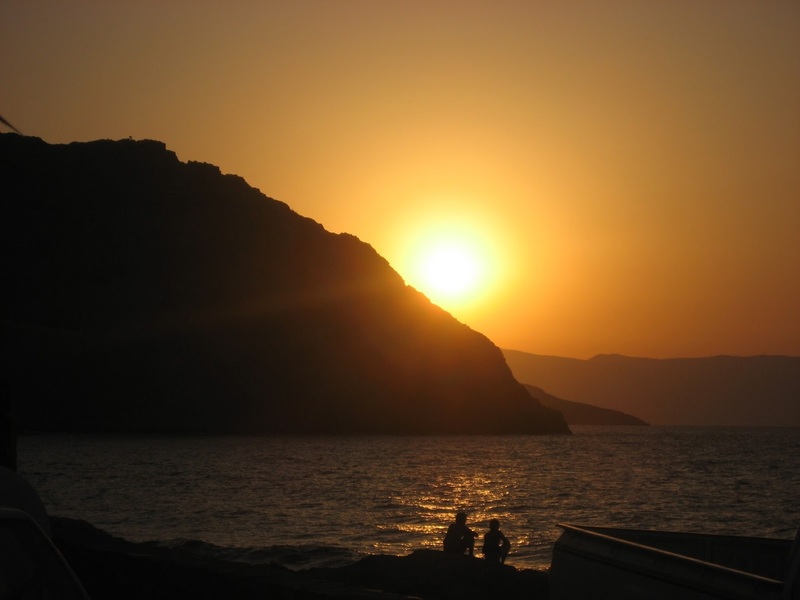 Mochlos is reached by way of a long drive down to the coast, round endless hairpin bends, from the road that runs from Agios Nikolaos to Sitia. It is growing a tourist destination, slowly, but still keeps a lot of its sleepy fishing village charm. 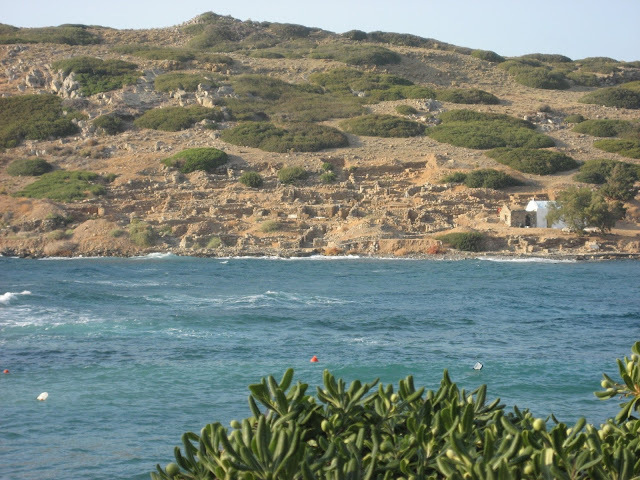 During the summer months, the place is slightly taken over by archaeologists, excavating the Minoan settlement on the islet opposite. These excavations are led by Jeff Soles of the University of North Carolina and Costis Davaras of the University of Athens (website: http://www.uncg.edu/arc/Mochlos/first.html). This current project has been running since 1989 and has yielded some extremely rich finds, including bronze ingots, ivory 'jewellery boxes', and gold jewellery (to name but a few examples). The site is permanently open to the public, if you can swim across the narrow straits. A warning however - there can be unexpectedly strong currents, particularly close by the island. Alternatively, during the summer months, it is easy to get a small boat across and back (about 5 E per person), just ask in one of the 3 or 4 tavernas along by the sea. Apart from this, however, there are paths that run along by a particularly lovely stretch of coast. Leaving Mochlos from one end of the village (from the car park), you get to a small marina and beach. In the other direction the path continues past the Minoan farmhouse at Chalinomouri. There are lots of small coves and places to explore. Excavations in the area of the car park, within the village of Mochlos itself, revealed the so-called artisans quarter of the Minoan settlement, and were still exposed when I last visited a couple of years ago, although there were plans to extend the car park in this direction. 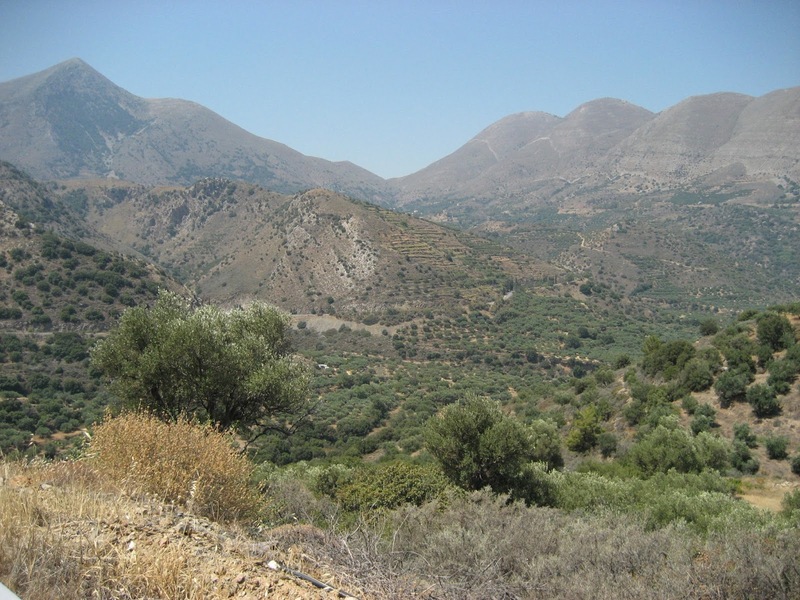 For a longer walk, you can head up into the mountains behind Mochlos, via any of the numerous paths that cross the landscape. We walked up the asphalt road to the (not so charming) village of Sfaka. In retrospect, that was probably a bit dangerous, due to the lack of pavement and the crazy Cretan driving. There are several small churches providing shade and rest along the way, and the views are quite spectacular - the coast at Mochlos and the island to the north, mountains leading all the way to Sitia in the east. All the tavernas were very accommodating, and nobody made us feel unwelcome. Due to my work for the archaeologists, we spent most of our time in the archaeologists' hangout - 'Ta Kochylia' (more often called 'Frangiadakis' after the owner). 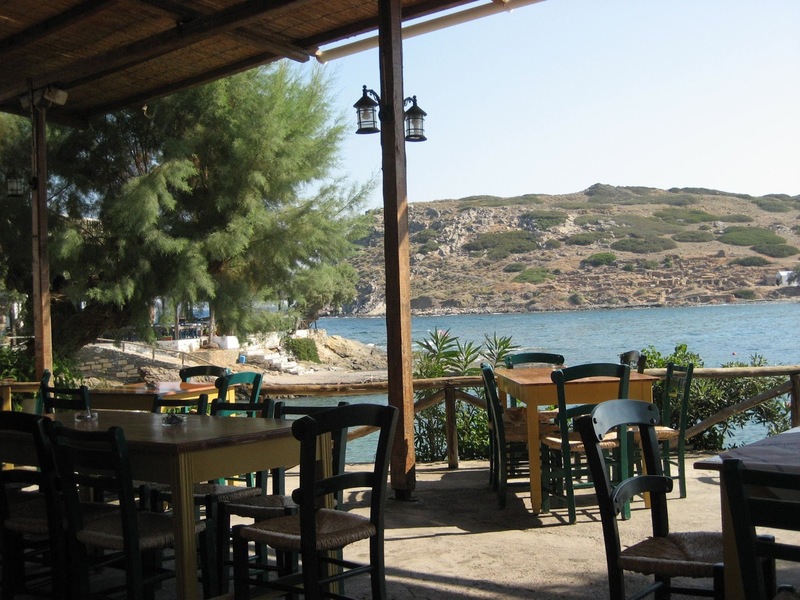 The space at the back of the taverna is perfectly separated from the main part of the harbour, so that you can comfortably drink a glass of wine and not feel anxious about your dog barking or sniffing the food of the person sitting at the next table. This space has Wi-Fi too. More importantly, however, I have seen some of the best sunsets of my life from the back bar of Frangiadakis' fish tavern. It might have been 'perks of the job', working with the archaeologists, but we managed to stay in a very reasonable apartment, also belonging to Giorgos Frangiadakis (go to the taverna and ask). The apartment was inside the village. It didn't have much of a view, but was new, very clean, with a small balcony and kitchenette. They were very kind about letting Sage stay there too. I imagine it might get quite busy at Mochlos during the height of summer. But in June-July, or September-onwards, I don't think it would be difficult to find accommodation with your dog in one of the many small rent rooms available in the village or along the route to the small harbour.